Chartered Bank 1 baht ordinary number printed signature + handwrite signature VF about 113,000 -119,000 baht. Chartered Bank 1 baht ordinary number VG about 19,000 -20,000 baht. Chartered Bank 5 baht ordinary number F about 295,000 -310,000 baht. HSBC 1 baht ordinary number F about 95,000 -100,000 baht. Banque De L'Indo-Chine 5 baht ordinary number UNC about 285,000 -300,000 baht. The international trade in the reign of King Rama V enormously grew up so that the coin production could not meet the high demand. while the government was trying to solve this problem, the three foreign banks in Siam requested the permissions to issue their own banknotes to clear the business transaction between their customers. 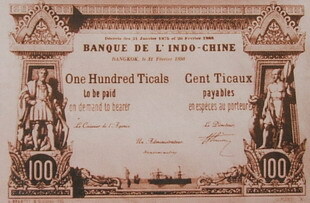 The Hongkong & Shanghai Banking Corporation, The Chartered Bank of India Australia & China, The Banque de L'Indo-Chine had sequencely launched their banknote since 1889. 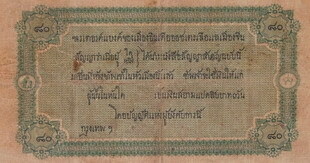 These banknotes were used in limited scope among the foreign merchants, not in public nationwide, because the government did not oblige to accept these notes as a legal. 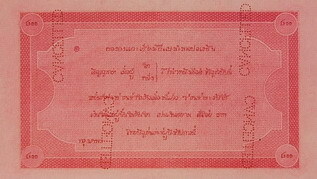 After the a href="1st-series-thaibanknote-price.htm">1st seriesThai banknotes issuance In 1902, all foreign's banknotes were withdraw from circulation. Anyway most Thai people get used to call the government issued banknote as "Bank" like they had ever called for foreign's banknote in short word. 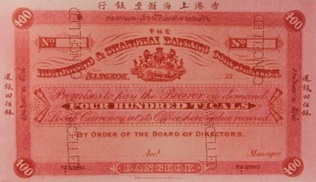 The Hongkong & Shanghai Banking Corporation branch in Thailand opened in 1888 and its first banknote issued in 1889 in 7 denominatios : 1 Tical, 5 Ticals, 10 Ticals, 40 Ticals, 80 Ticals, 100 Ticals and 400 Ticals. The banknotes were printed at Barclay & Fry London. 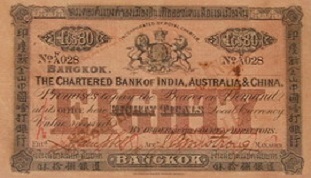 The Chartered Bank of India, Australia & China branch in Thailand opened in 1894 and its banknotes issued in 1898 in 7 denominations : 1 Tical, 5 Ticals, 10 Ticals, 40 Ticals, 80 Ticals, 100 Ticals and 400 Ticals. The banknotes were printed at W.W. Sprague & Co. London. 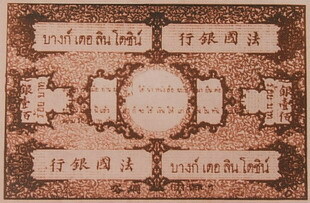 The Banque de L'Indo-Chine branch in Thailand opened in 1896 and its own banknotes issued in April 1899 in 4 denominations : 5 Ticals, 20 Ticals, 80 Ticalsand 100 Ticals. The banknotes were printed in France.